Two reviews in one day? That's not as uncommon a concept as you might think. 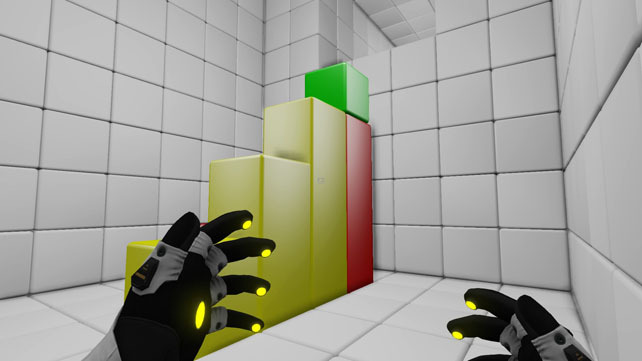 What is a more uncommon concept is a first-person puzzle game. Obviously we're all aware of the big guy on campus, Portal, but what about Q.U.B.E. : Director's Cut? That's the next game SuperPhillip Central will be putting its selective focus on. Here's my review. The concept of the puzzle is nothing new to gaming. However, the puzzle game itself hasn't seen as much use in the past decade... that is until independent developers started to bring it back and in big ways. Q.U.B.E. : Director's Cut is one such game that is all puzzles all the time, but the novelty here is that it's all done in a first-person view with an engaging narrative. See why Q.U.B.E. : Director's Cut is definitely a title you should look into. Q.U.B.E. : Director's Cut doesn't hand-hold like so many games nowadays seem to enjoy doing. No, it thrusts players right into the thick of things, offering new concepts at a slow but steady pace that are introduced in clever ways. Never will you find yourself having to learn two concepts at once. It's deliberately designed so you are taught one thing, and then the game puts that concept into different scenarios until you're fully aware on what is needed to be done when you see it again and how you can utilize it in various ways. You become cognizant of what that concept/aspect of the game is all about. The fun of Q.U.B.E. : Director's Cut teaching you how to play is that you get a sense of great accomplishment for figuring out what the game expects of you to do. You get that wonderful feeling of feeling smart (or in my case, feeling smarter than I am) when you solve a puzzle after tinkering around with it for several minutes, ever inching closer to the proper solution. You have but three inputs as your unnamed character in the game. You can extend and contract objects and certain blocks without touching them with your hand, and you can jump. That's it, and that's all you need as the puzzles in Q.U.B.E. : Director's Cut unsurprisingly enough all have to do with different colored cubes and how you interact with them. A nice, laid out stairway for yours truly? I'm too kind. There are red blocks that are introduced first, which you can extend up to three times and contract with presses of both the back left and back right shoulder buttons. Then blue blocks come in, which can be pressed down, and when you walk across them or an object moves on top of them, they launch whatever is on top of them upward. A trio of yellow blocks serve as steps. Whichever of the three blocks you interact with serves as the longest of the three blocks in the makeshift staircase of blocks. Finally, there are green blocks and balls that can't be interacted with by your character directly, but they can be pushed and maneuvered by other block types. Later puzzles involve a combination of all of these block types, as well as rotating walls that spin on your command. Then there are balls that must roll through specific invisible, colored cubes in order to change color and reach a same colored hole. These puzzles were the most fun for me because they didn't just require a thought process to figure out how to solve them, but they also required precise timing to complete. by using the rotatable wall to move it to one side of the room. Other puzzles include a giant maze like those tilt and tumble handheld games where you try to get an iron ball into the right hole by moving around the game. 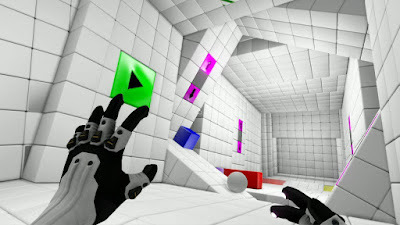 In Q.U.B.E., you interact with buttons on each side of the maze to make it tilt, moving the green ball inside every which direction as you guide it to the desired hole in the labyrinth. This was another enjoyable puzzle to do that required thinking and timing. 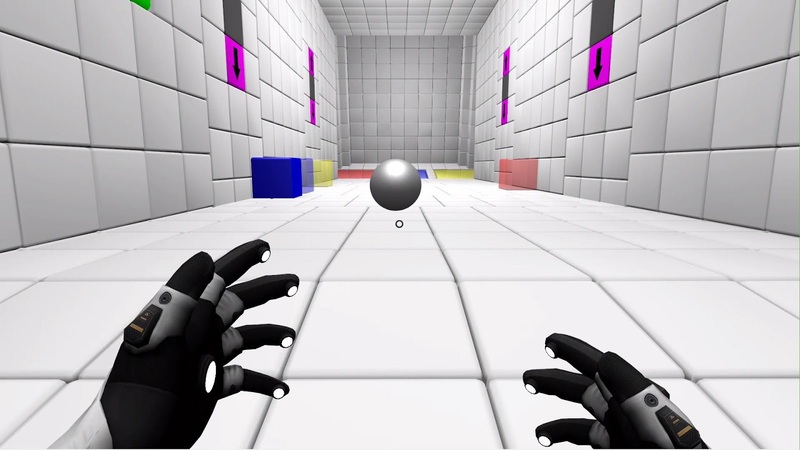 Having but three control prompts makes for a simplistic game, and that's one of Q.U.B.E. : Director's Cut's strengths. The simplicity goes into the minimalist visuals, where white cubes of different shades are the primary visual seen. The use of red, blue, and yellow against the white makes for colors that pop out well to the eye. This simple art style also allows the game to run at a steady frame-rate. The simplicity even continues with the narrative Q.U.B.E. : Director's Cut possesses. You wake up as an amnesiac inside some sort of cubed area. A female astronaut contacts you, informing you that you're inside a structure that, like an asteroid, is careening towards the earth. The only way to stop it is for you to continue through the structure's many chambers and puzzle-like rooms. However, it isn't long before you as the player start questioning the astronaut's motives, as a male voice tells you that she's lying and that you're deep underground like a rat in a maze. Although the narrative is one that is intriguing, the ultimate truth isn't as rewarding as you might expect, which is disappointing. Well, we're certainly not at the bowling alley! Furthermore, Q.U.B.E. : Director's Cut suffers a bit when you're tasked with doing some first-person platforming. The jumping isn't wholly precise, meaning that in some puzzles where some sense of vertical-ness is involved, you can fall quite easily. This results in you having to do the puzzle all over again. Secondly, for those who want the option to reverse the controls of the Y-axis for looking around, this option is not there, unfortunately. Still, Q.U.B.E. : Director's Cut is a wonderful change of pace, as there aren't many games like it (or at all) on the PlayStation 4, Xbox One, and Wii U. If you fear the 2-3 hour main campaign won't last you long, never fear. There are also timed challenges to tackle in several of the game's other modes. Q.U.B.E. : Director's Cut delights with its plenty of puzzles delivering many challenges for your brain and fingers as well as many "Aha" moments. Review copy provided by Grip Digital s.r.o.